A few weeks ago I finally perfected my chocolate cupcake recipe! 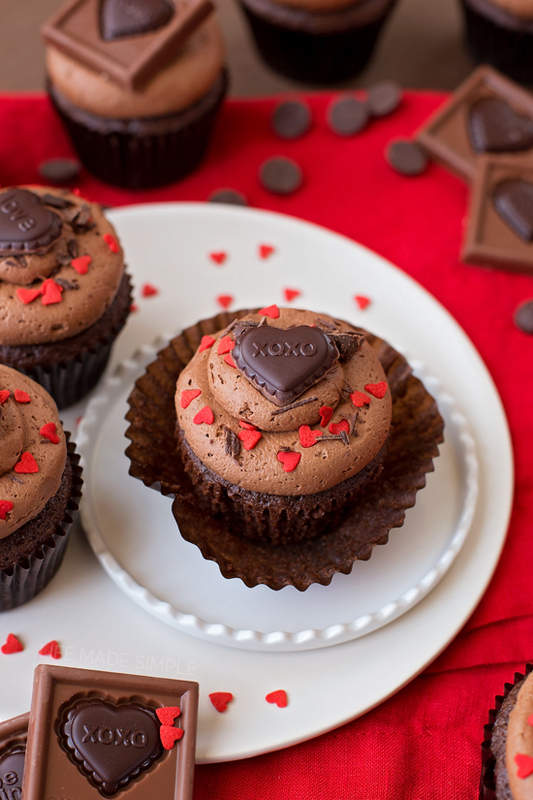 So I decided to use it to make these festive chocolate sweetheart cupcakes. They’re incredibly moist, tender and topped with the fluffiest chocolate buttercream! I used these fun little Valentine’s Day Impressions along with some chocolate shavings and heart sprinkles to make these extra special. Have I ever mentioned just how much I love Ghirardelli? Maybe it’s because I grew up near San Francisco, or because I love all of their decadent dark chocolate bars. I do know one thing though, their baking products are a pantry staple. As a frequent baker, I love using their 60% cacao baking chips, they ensure the best taste and texture to any baked treat or decadent confection I make! I used 2 oz. 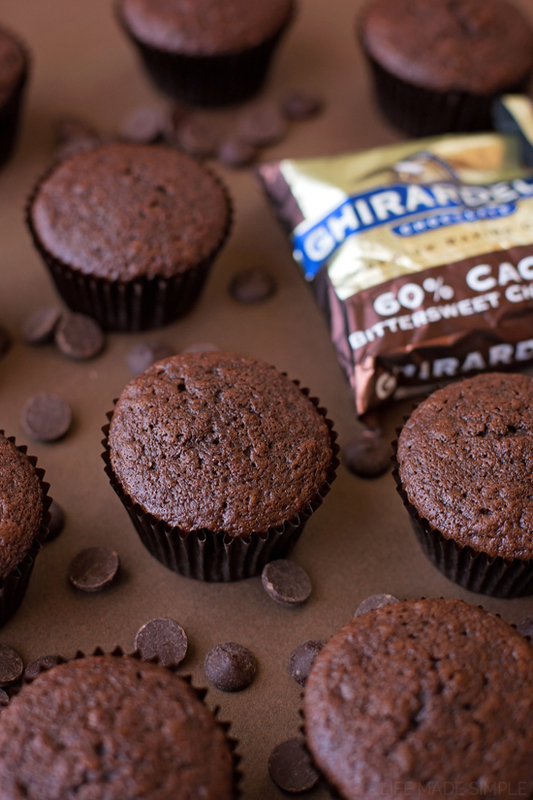 of their chips (melted) to help give these cupcakes their rich chocolatey flavor. But I didn’t stop there. I shaved the chips for the topping and popped out the centers of their Valentine’s Day Impressions too. Have you ever tried them? They’re perfect for snacking on since their individually wrapped and make great little gifts for Valentine’s Day. I especially love the milk & dark chocolate combo, however, they also come in milk & white. I decided to leave a few of them whole and just press them into the frosting of a few of the cupcakes- it was easy and just as pretty. 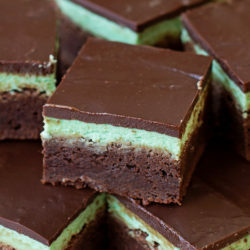 So before you jump into the kitchen to whip up a batch of these beauties, let me give you a few tips. First, make sure all of your ingredients are at room temperature. Use high quality ingredients (the better the ingredients, the better the cupcakes will taste). Don’t swap out full-fat sour cream or buttermilk for anything else! 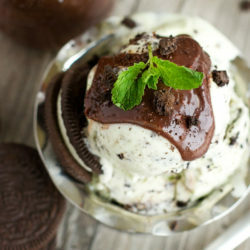 Use espresso powder to enhance the flavor of the chocolate. Lastly, do not overbake these cupcakes! Ok? Now let’s get baking, because these cupcakes are a definite must-make! Whether you’re making these for friends, family or for someone extra special, these chocolate sweetheart cupcakes are sure to be a hit! 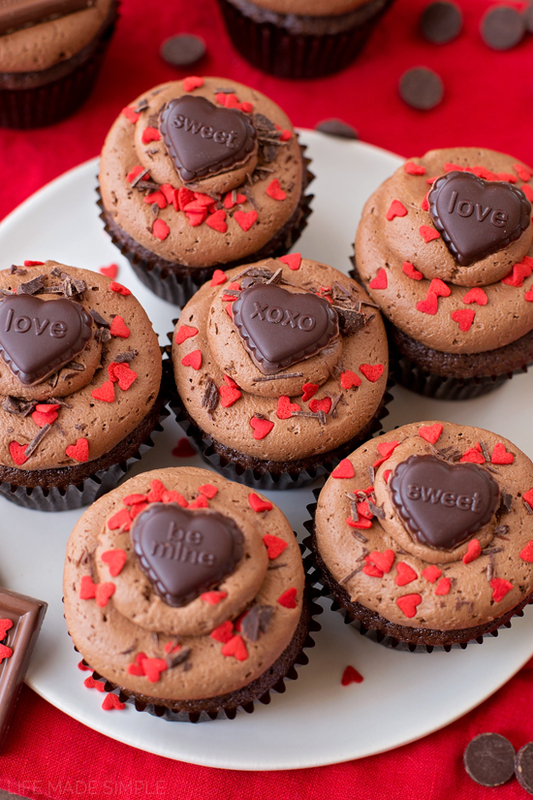 There’s no need to buy those hard little conversation hearts, because each cupcake comes with it’s own message! How cool is that?! Enjoy & happy Valentine’s Day! 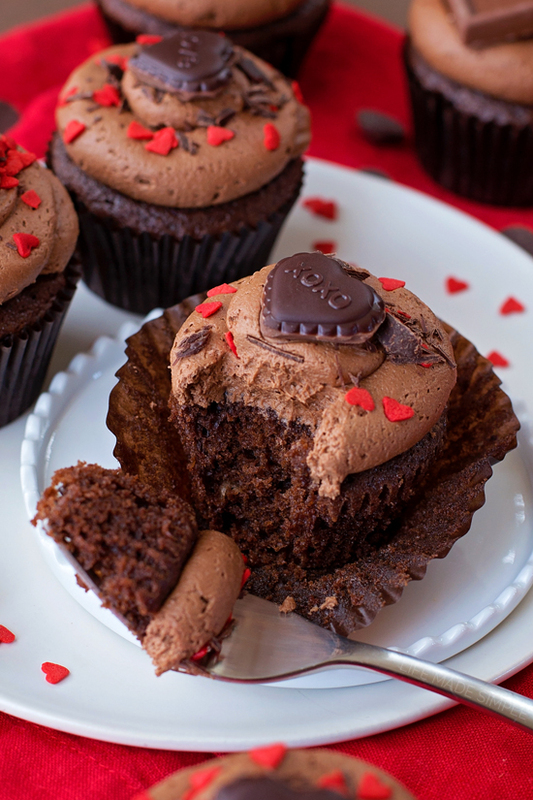 Rich, moist chocolate sweetheart cupcakes topped with a thick cocoa buttercream. Perfectly decorated for Valentine's Day! In a medium size mixing bowl, whisk together flour, sifted cocoa powder, salt, and baking soda. With mixing speed on low, gradually add the dry ingredients along with the sour cream (or buttermilk) and the warm water/espresso mixture. Mix just until combined. Allow the batter to rest for 5 minutes. Meanwhile, to prepare the frosting, in a large mixing bowl or the bowl of a stand mixer, beat the butter until smooth and creamy, about 3 minutes. Turn mixing speed off, add the salt and the vanilla extract. Turn mixing speed on to low, then gradually add the powdered sugar and cocoa. Beat for 2 minutes, then turn to low and add the cream. Turn the speed up and beat for 2 minutes or until light and fluffy. 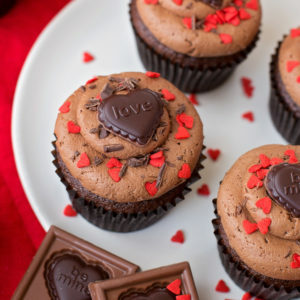 Spread or pipe on to the cooled cupcakes, garnish with sprinkles, chocolate shavings and the centers of the Ghirardelli Valentine's Impressions. 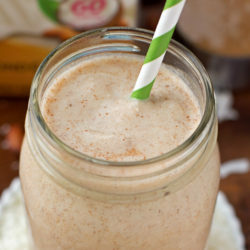 *Dutch-process or Special Dark cocoa powder can be used in place of unsweetened cocoa powder, or a blend of each. I’ll take 2 please!! 🙂 These are so pretty and look absolutely delicious! Wow – those look so good! 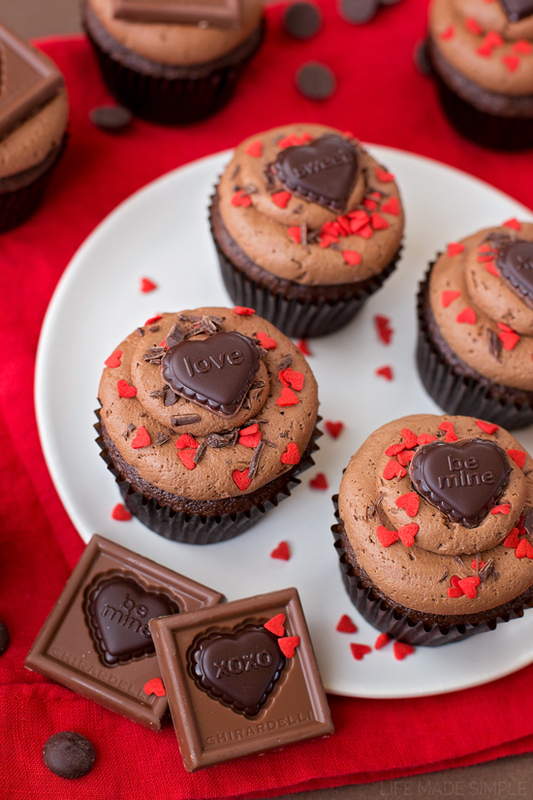 They look like the perfect Valentine treat! Natalie, these are gorgeous! They look so delicious! Hehe! I can’t blame you… they’re pretty darn delicious! These look SO amazing! And you can never, ever go wrong with Ghirardelli Chocolate! Just had surgery and was in the hospital for 6 weeks. Not allowed out of the bed yet. Sure is wrong time of the year to see desserts like this and know you can’t make them. They look absolutely delectable. Congratulations on your perfection. These look fantastic, I LOVE our posts! Pinning!